As summer seems to be winding up, Piping Plover nesting season seems to be winding down. 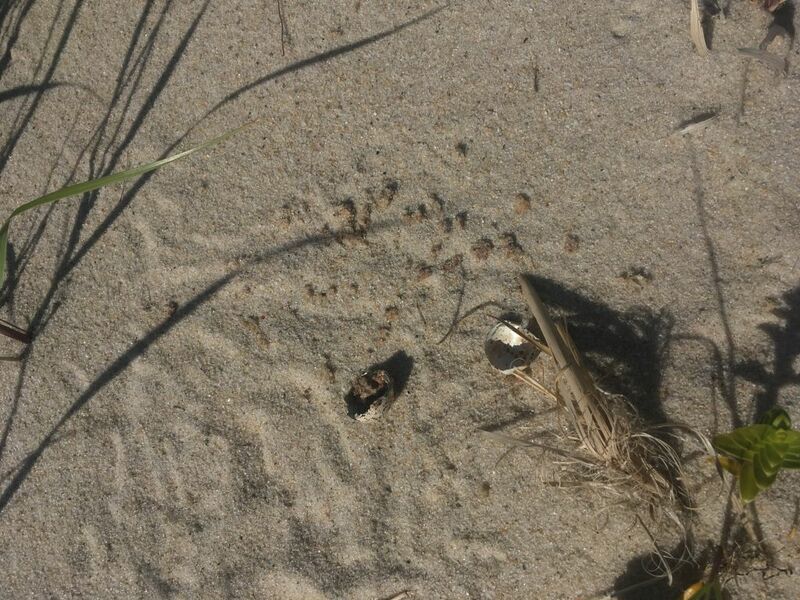 The last of Wellfleet Bay’s monitored Piping Plover nests on the Outer Cape, from Tern Island to Truro, have hatched. Although it seems we monitored a lot of chicks this summer, many didn’t survive to fledge. A total of eleven pairs produced 17 chicks. Unfortunately, a number of chicks were eaten by predators, but 10 of them have fledged (meaning they can fly, at least a bit) or are pretty close to it. If the rest of the chicks make it, this would give us a productivity rate of around 1.54. The state’s target for a stable population is 1.24. So it’s good news! 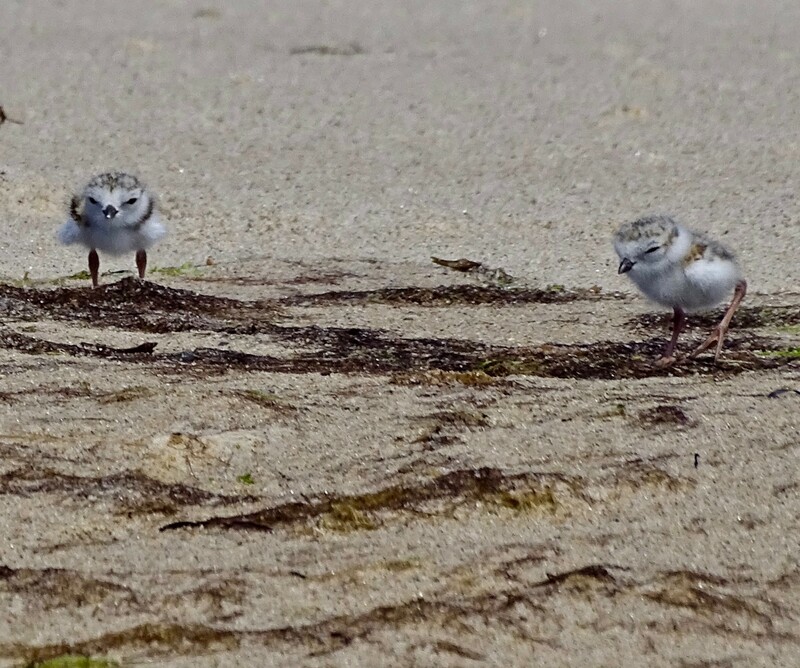 Adult female and two 12-day-old chicks at Beach Point. (Photo by Jeannette Bragger). I came into this season with a little plover experience, but not enough to realize how invested I would become in each and every one of the nests we monitor. Each location has its own struggles such as predation, human disturbance, or overwash. One of our biggest issues this season was depredation by crows, who got quite a few of our nests. Crosby Landing Beach in Brewster had two pairs with nests. The first pair fledged 4 chicks, which we are thrilled about! The second pair wasn’t so lucky, as their nest was depredated by crows just a few days before it was due to hatch. Often times, a pair with a failed nest will try again, but it was apparently a little late in the season for this pair to re-nest. A predated nest is a disheartening sight. (Photo by Briana Pascarelli). While each site has its own issues, they also have had some surprises. While we’ve traditionally had at least one pair of plovers at Fisher Beach in Truro, the birds keep us guessing with the new and creative nesting spots they find there. For at least the third year in a row, a pair of plovers nested in a large blowout behind the dune on the main beach. This isn’t a typical location for plovers to nest, but monitoring from prior seasons has led us to check here. Once the nest hatched, this pair, amazingly, walked their tiny chicks out of the steep dune blowout over to the shore of the Pamet River where the family remained until the chicks fledged. A couple of weeks later, we unexpectedly found a second nest right on the shore of the Pamet where we’ve never had a nest before. This pair, sadly, lost all of their chicks, but the first pair fledged all four. Just across the Pamet from Fisher, Corn Hill Beach had two pairs of birds, but only one was successful, hatching 3 chicks. We also had a small Least Tern colony here, but it seems as though a coyote found its way into the colony and those who survived dispersed. This unfortunate predation event occurred right around the same time the second pair at Fisher lost their 4 chicks. 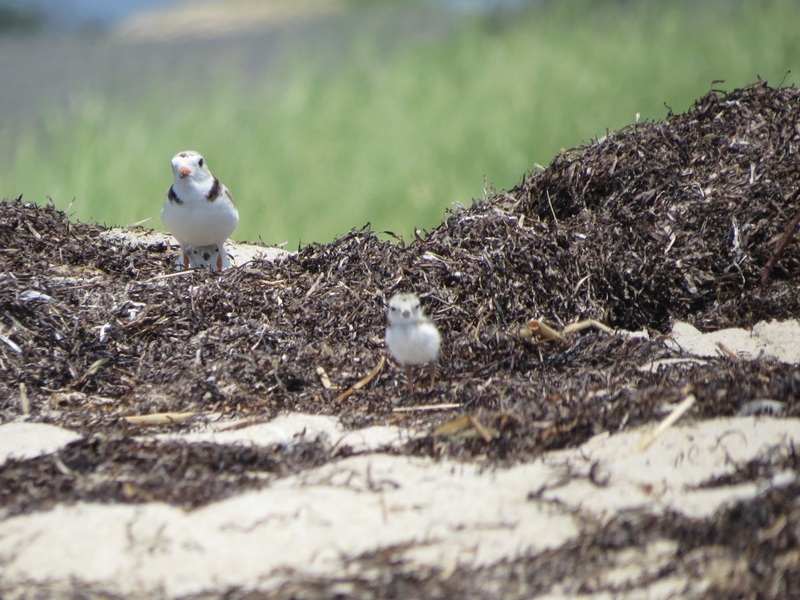 Over on the ocean side of Truro we have a pair of plovers at Ballston Beach who finally had success on their third nest attempt. Crows got their first two nests and are the prime suspect in the disappearance of two of the three chicks. The “y” shaped tracks of the American Crow near the predated nest are pretty distinctive. 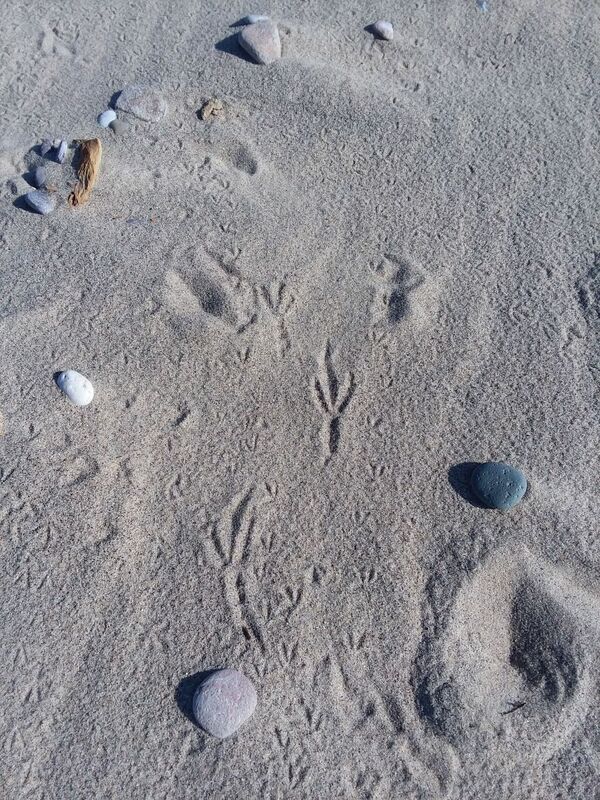 The smaller tracks are plovers’. Another Truro beach gave us a pleasant surprise this summer. A site at Beach Point that hadn’t had plovers in a couple of years suddenly had a nest! Beach Point is well north of our other Truro sites but fortunately, we have some amazing volunteers who help us throughout the season. For example, Jeannette Bragger has monitored Beach Point almost every day. She is also the one to thank for the majority of the photos I’ve included in this post. Beach Point had a 3-egg nest and 2 of the 3 chicks have survived. Maybe my nicest surprise was finding a late one-egg nest at South Sunken Meadow Beach in Eastham. Since 2012, this beach had been home to a banded plover we called El Bandito, who we fear may have been eaten by a Snowy Owl shortly after his return in April. But it brightened our season when 3 chicks hatched, and although they’re not Bandito’s, it is still some very exciting news! As I noted at the beginning, the birds are starting to think about fall even in mid-summer. Flocks of several dozen Piping Plovers have been spotted as they and other shorebirds start to stage–or group together– before flying south for the winter. It’ll be exciting to know that our fledglings have started their first long journey and may soon be as far away as the Bahamas or even Cuba! While writing this post, I couldn’t help but feel a little disappointed each time I wrote about an unsuccessful nest, until I looked at the bigger picture. 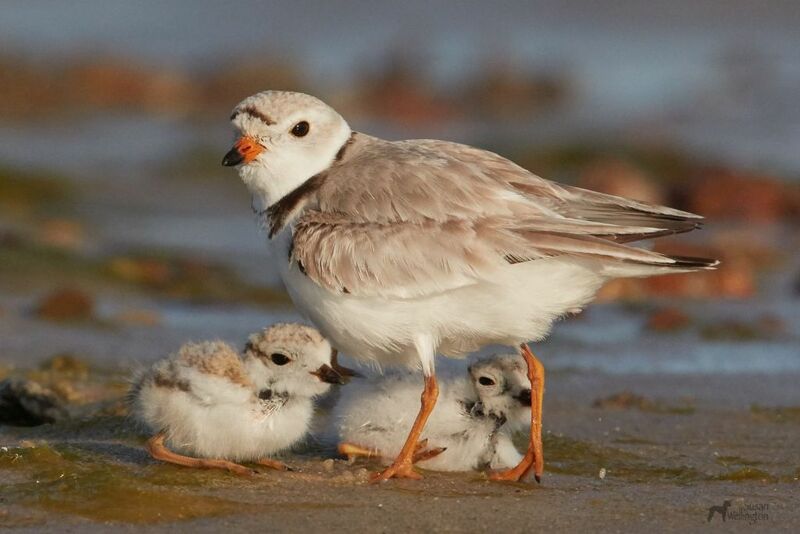 The potential success for our Piping Plovers this year is very high and we can use what has happened this season to protect even more nests next season. It has been a great experience to be a part of this field season, and we can only hope that numbers for Piping Plovers keep heading in the right direction. 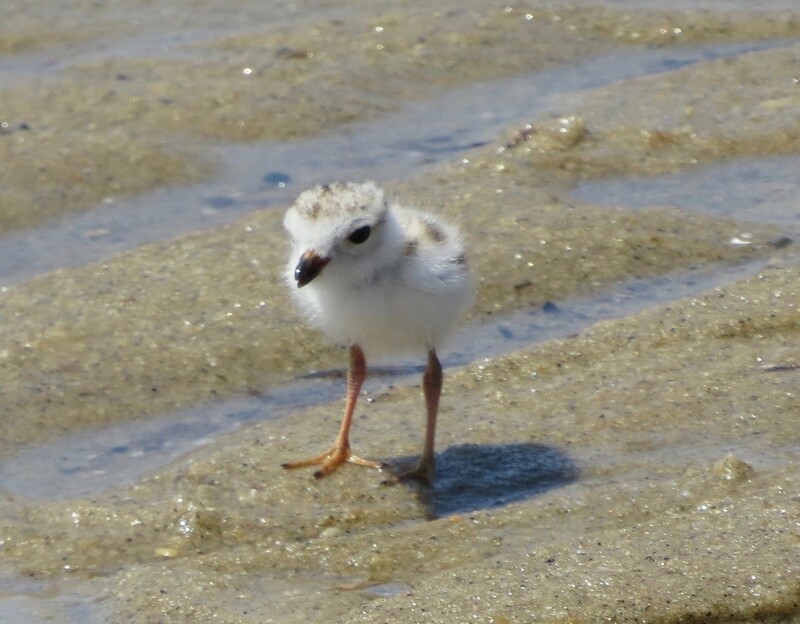 Chicks born and raised at Brewster’s Crosby Landing Beach (photo by Susan Wellington). This post was contributed by Wellfleet Bay’s coastal waterbird field technician Briana Pascarelli. A graduate of the University of Rhode Island with a degree in wildlife conservation and biology, Briana enjoys field work and is also a turtle enthusiast. Before coming to Wellfleet Bay, she worked as an attractions cast member in Disney’s Animal Kingdom at Walt Disney World in Orlando.